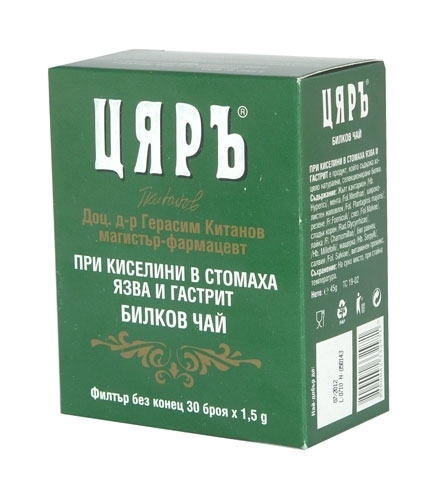 Successful herbal combination for the treatment of ulcers, heartburns and gastritis of the "Zyar" series. Nervous tension, irregular or fast food, the ingestion of a large amount of food, and eating when suppressed can provoke sensations such as swelling, weight, dull pain or heartburn. These are the root causes of severe sufferings such as gastritis or ulcer. The herbs collected in this tea have a beneficial effect on their sedative, anti-inflammatory, soothing and healing action. They suppress unpleasant burning and, in combination with vitamins, improve the general condition of the body. The vitamin substance is selected for hot water infusion. One cup of tea contains at least 25% of the daily vitamin demand for an adult. Herbal tea CYRAS contains entirely natural, selected herbs. St John's wort, mint, broadleaf, fennel, mallow, sweet root, chamomile, yarrow, thyme, salvia, vitamin premix. Pour one filter bag with 200 ml of boiling water. Spill 4-5 minutes. Pick up as desired. - Never drink the herbal tea very hot. This is only acceptable if you wish to cause sweating. - Drink tea slow and opportunity nose so small sips. Enjoy it and constantly think about its particular impact. - Drink at least one cup of tea in the morning, on an empty stomach. This increases the activity of the active substances in the body. - It is best to drink 3 cups a day. Your body will be supplied with the necessary amount of herbal substances throughout the day.